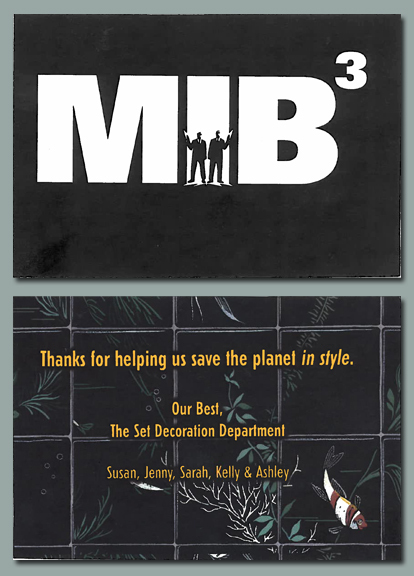 The Set Decorators for the upcoming movie Men in Black 3 enlisted Almstead to prune three Cherry trees framing the entrance to the Triborough Bridge and Tunnel Authority in Battery Park (better know to fans as Men in Black Headquarters). 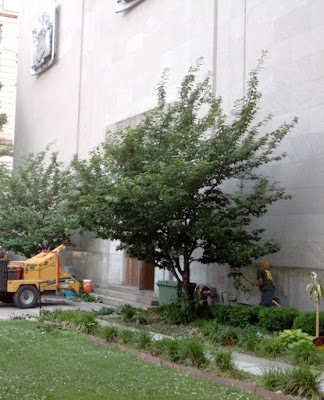 The request was for us to prune the trees back significantly to gain more visibility of the building while still maintaining a natural shape and not making fresh cuts large enough that they would be obvious on screen. While this job required a bit more meticulousness than usual, it's not unfamiliar territory for us. We call this type of work a "natural crown reduction" in arboriculture. In this case, the crew did a great job of removing about 25% of each tree's canopy while still maintaining their natural growth habits and avoiding that "just pruned" look. In addition to the aesthetic benefits, natural crown reduction is also much better for trees in the long run compared to less subtle methods like topping (simply cutting back the edges of the crown to where you want them the same way you might shear a hedge). Making cuts at natural junctures in the tree and thinking about which branches are most important to its underlying structure keep future growth headed in the right direction, prevent stress reactions like water-sprouting, and minimize the chances of decay as a result of the pruning wounds. It's definitely the best way to reduce the size of a tree, even if your landscape isn't about to be Hollywood's next big star.